This is pretty much a breakdown of everything within Afterburn, essentially describing alot of the features and elements of Afterburn. To start off, assuming everyone's used Afterburn at least slightly before and knows what it does. If you haven't then go play with it for a while and come back. Afterburn is a very powerful plugin but at times can really require a lot of CPU and RAM if you want to meet deadlines on time. It does great volumetric particles and can be used for anything from clouds and smoke, to explosions, fire, water, even landscapes amongst other things. The more familiar you become with it the more you'll realise the possibilities are endless. To begin, you need a particle system. One thing to keep in mind with Afterburn is, if you're using omni lights, it considers one omni light to be several lights instead of just one light. So this kills speeds a lot by using omni's so use them only where necessary. 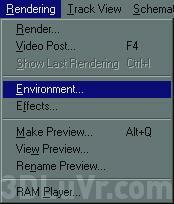 To add afterburn to your scene, go to the Enviroment panel located under the Render menu. created, this effect is required for Afterburn to render. If you scroll down the Afterburn manager you'll see "source particles/daemons" and "source lights". Here's where we can add in the daemons and particles and the lights we want to use with Afterburn. If you click on the pick button under source particles/daemons the button will turn green allowing you to select only particle systems and daemons, which is where you can select any of the existing particle systems you want to use. 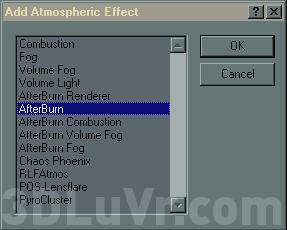 Once you have put them into Afterburn's manager, it will use these particle systems as reference to where the volumetrics are placed in world space.